Scratching, bending, light damage and air or water deterioration are a game collector’s worst enemy. Protecting your retro game collection could mean the difference between your collection growing in value or degrading in value. Over the past two years, as my collection has grown, I’ve invested more time, money and effort into making sure my assets stay in pristine condition. This is especially important for me, as I never add games to my collection unless they’re in excellent condition. I’ll be discussing game protectors. So first let me tell you where I purchase my game protectors. Please note that this is not an endorsement of this product or the buyer—just a summary of my experience purchasing game protectors so far. 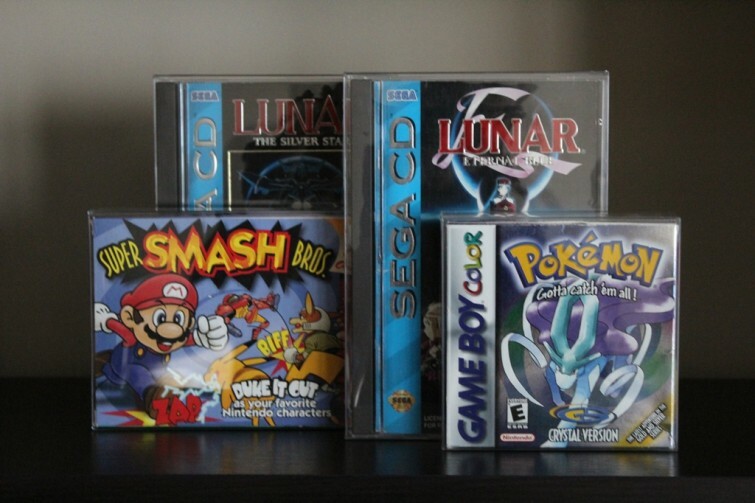 I purchased my game proctors primarily from a company on eBay named, VideoGameBoxProtectors, which sells protectors for games ranging from loose N64 games and boxed N64 games to sleeves for DVD or Blu-ray-size protectors. They use archival grade plastic, which is supposed to protect against the major elements that damage games: moisture, air, scratches and light. I’ve purchased PS1/Dreamcast sleeves, PS2/XBOX/XBOX360/GC/Wii sleeves, N64 box protectors, loose NES and SNES protectors and Sega CD/Saturn box protectors. And I’ve been very pleased with my purchases so far. The featured photo above are just a few of my box protectors that are keeping my more treasured games in the condition that I found them in. Do you plan to stack your cases or cartridges on top of each other? If so, consider rearranging your collection so that your games are displayed on their sides vertically on the shelves instead of stacked on top of each other. This will prevent gravity from bending or cracking your games, which is especially important to consider when you’re storing boxed consoles which will crush whatever they’re stacked on. If you must stack them, avoid putting your more valuable games on the bottom. How many games do you have that exceed $40 in value? It goes without saying that the more expensive the game, the more effort you should put into protecting it. For example, I purchased about 100 Sega CD/Sega Saturn protectors, because that’s how many games that I anticipate collecting in the near future that will be valued at more than $30 to $40. Those games are worth spending an extra $1 to protect. In the event that cheaper Sega CD games grow in value, I’ll likely purchase more protectors. And I repeat this same process for games for all consoles. How long do you plan to keep your collection? The longer you plan to collect, the more likely you are to damage your games and thus more important it is to protect your games. Many of your retro games may go up in value, if they’re properly protected. But retro games are also more vulnerable to things like water damage or cracks. Committing to an effective system for protecting your games early on will save you money and anxiety later down the road. Do you intend to move any time soon? You’ll want to commit much more attention into moving your games than you would storing or displaying your collection. Moving is one of most stressful things you can do. So when you’re in a hurry to pack everything up and move as quickly as possible, things can get damaged. So if you’re planning on moving, set aside time every day for weeks prior to properly packing up your collection with padding. Consider investing in game protectors before the move and buy plenty of bubble wrap. Do you keep your games in a room with windows? Anyone who’s gone to buy games at an outdoor flea market knows that putting games out in the sun for extended periods of time pretty much ruins the game cases and labels. So if you plan on storing your games near a window, keep in mind that direct sunlight, even a little bit, could have a permanent effect on the condition of your collection. And when you’re buying protectors, make sure that they provide UV protection for your games. Make sure you inform your kids how to properly take care of your and their games—from removing the games from their cases, to placing them in the gaming consoles and putting them back where they came from. So many parents that I meet at garage sales provide no instructions on how to take care of their games, and so their games are dirty, damaged and disorganized. Consider placing your more valuable games on the top shelf. Do you have a lot of different consoles? Keeping your controllers and chords will be the trickiest part of protecting your collection. You’re definitely going to want to invest in a reliable organizational system for keeping all of your chords and controllers in an accessible location that doesn’t damage the chords, buttons or joysticks. Too much weight on controller (especially N64 controllers) joysticks could make them nonfunctional. Are you open about your address on the web? Never let others know where you live. This could open your home up to theft. In fact, many of the collectors who have the largest collections in the world are extremely private about their personal information. I once sold a Zelda test cartridge to the owner of one of the largest video collection in the world. He gave me a PO Box to send the cartridge. If you’re trading a game with someone from far away, consider having them send it to where you work or a PO Box address. Do you experience floods in your area? So many of my collector friends have lost thousands of dollars worth of games in floods, since many of them put their games in their basement. If you keep your games in a lower elevation in a flood-prone location, work out a plan to protect your collection. And if you plan to move in the near future, you might want to simply store your games in large, water-proof containers until you move. Do you experience earthquakes in your area? Invest in wires that keep your game shelves tied to the walls, especially taller book cases which are more top-heavy. And make sure your games aren’t too close to the edge of the shelves. For your games that are in hard cases like Playstation, Sega CD, Sega Saturn, Dreamcast, etc. should be kept in protective cases, which will protect them in the event that they fall or something falls on them. We’re just scratching the surface on protecting your collection. So stay tuned for more collecting tips right here on Retro Chronicle.